This is a simplified version of my Chicken Tortilla Soup that I posted on a few years ago. We make this a lot when we know we have a full day to watch football or if we want a lot of leftovers for the rest of the week because this recipe makes a ton. 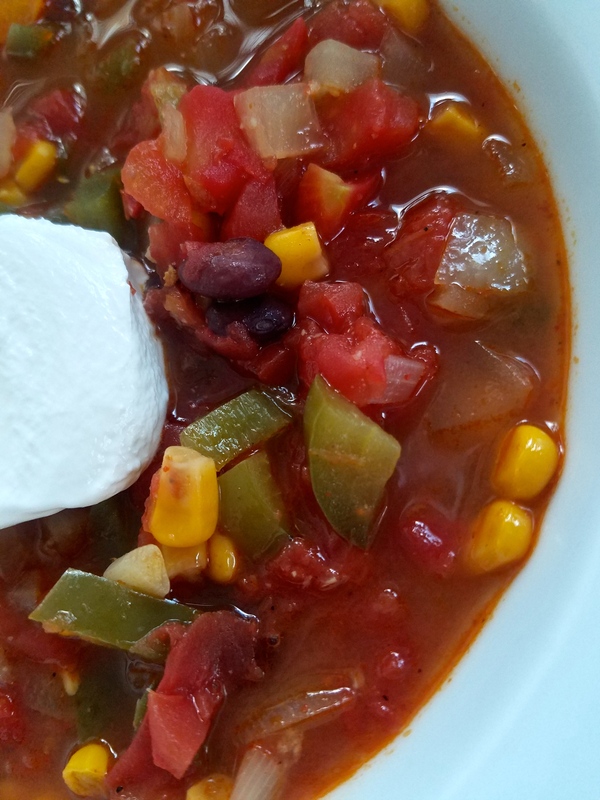 This is a meatless/cleaner version but you could definitely add shredded chicken, use real sour cream, add cheese, etc if you want something a little less health-conscious and a little more flavorful. 1. Heat up 2 tbsp olive oil in a large stock pot over medium heat. Add in 3 minced garlic cloves and stir constantly for 30 seconds to avoid burning. 2. Add in 1 larged diced white onion and 2 diced bell peppers. Cook until softened, about 10 minutes, stirring occasionally. 3. Add in 2 tbsp chili powder, 2 tsp salt, 1 tbsp cumin, 1/2 tsp cayenne pepper (full tbsp if you like it spicier), 1 tsp sugar and 1 tsp pepper. Stir to coat. 4. Add in one 15.25 ounce can of corn that’s been drained and rinsed (I like to use no-sodium). 5. Stir in one 28 ounce can of petite diced tomatoes with the juice and all. 6. Add in one 15.5 ounce can of black beans that have been drained and rinse, along with two 32 ounce cartons of chicken stock. Bring to a boil then let simmer on low heat for about an hour. Serve with a dollop of greek yogurt or add any toppings you like! Heat up olive oil in a large stock pot over medium heat. Add in garlic and stir constantly for 30 seconds to avoid burning. Add in onion and bell peppers. Cook until softened, about 10 minutes, stirring occasionally. Add in chili powder, salt, cumin, cayenne pepper, sugar and pepper. Stir to coat. Stir in tomatoes with the juice and all. Add in black beans along with chicken stock. Bring to a boil then let simmer on low heat for about an hour. Serve with a dollop of greek yogurt or add any toppings you like!